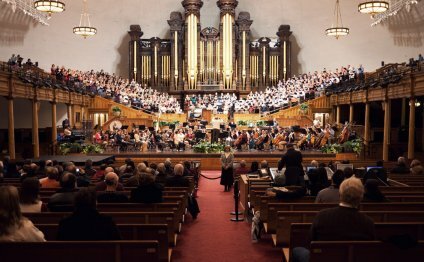 A REHEARSAL of the Mormon Tabernacle Choir is unlike any other church-choir practice. The 360-member choir rehearses every Thursday evening for two hours, with a complete orchestra in a fully-fledged concert hall dominated by a glorious organ with gilded, cylindrical pipes. Visitors are not only allowed, but encouraged to come in and listen to pre-paschal bits of Handel’s “Messiah”, which the choir is performing this weekend. Foreigners are made especially welcome. The Tabernacle Choir’s musical tradition is like the Mormon religion itself: inclusive and open to outsiders. It is also staunchly conservative. It has constituted perhaps the most reliably Republican group of voters in the country—until now. With his incendiary talk about undocumented immigrants and Muslims, Donald Trump is testing the loyalty of Mormons, who represent around 60% of voters in Utah, to the GOP. If Mr Trump were to become the Republican Party’s nominee, as seems increasingly likely, a majority of people in Utah would do what might once have seemed unthinkable: vote for the Democratic Party’s nominee, whether it is Hillary Clinton or Bernie Sanders, according to a recent poll by Deseret News, Utah’s oldest daily, and KSL, a local television station. Ted Cruz, the Texas senator, or John Kasich, the governor of Ohio, on the other hand would handily beat Mrs Clinton and Mr Sanders, according to the poll. Utah hasn’t voted for a Democratic nominee since Lyndon Johnson ran against Barry Goldwater in 1964. The Republican caucuses on March 22nd confirmed Mormons’ aversion to Mr Trump. Mr Cruz won 70% of votes and bagged all of Utah’s 40 delegates (for which he needed to get more than 50%). Seventeen percent voted for Mr Kasich and just 14% cast their ballot for Mr Trump. On the Democratic side, Mr Sanders did even better than Mr Cruz with 79% of the votes; Mrs Clinton received 20%. Shortly after Mr Cruz’s landslide victory in Utah, Jeb Bush, a former governor of Florida, endorsed him, calling him a “principled conservative” and the party’s best chance at countering the “divisiveness and vulgarity” of Mr Trump’s campaign. Mr Bush followed the example of Mitt Romney, a Mormon who was the Republican nominee in 2012, and probably for similar reasons. Mr Romney said a few days ago that he would vote for Mr Cruz in the Utah caucus, but only because he was the only candidate who could stop Mr Trump. He stopped short of an endorsement of Mr Cruz, telling his followers on Facebook that the candidate he really likes is Mr Kasich, but that at this stage a vote for the Ohio governor was a vote for Mr Trump. Although Mr Romney (and Mr Bush) consider Mr Cruz the lesser of two evils, Mr Cruz is certainly no champion of immigration reform; nor does he have a conciliatory attitude towards Muslims or other religious minorities. After the terrorist attacks in Brussels on March 22nd, he suggested that America empowers “law enforcement to patrol and secure Muslim neighbourhoods before they become radicalised”. Such statements sit uneasily with Mormons, who have not forgotten their history of persecution and are to this day considered by some fellow Christians, especially evangelical Protestants, a somewhat devious, wacky cult. In the 19th century a mob in Illinois murdered Joseph Smith, the founder of the Church of Latter-day Saints, and his followers were chased out of Illinois and Missouri. They fled westwards to the Salt Lake valley where they began to build a community in what is today the state of Utah where they could live out their values, which include strict self-discipline, abstinence from alcohol, cigarettes and caffeine as well as a strong work ethic. Donald Trump junior said in the run-up to the Utah caucuses that his dad’s values are the same as Utah’s because he is a teetotal non-smoking workaholic with a strong sense of family. That didn’t change Utahns’ minds. They overlooked some of Mr Cruz’s more divisive statements and handed him his biggest victory in the election so far.